Introduction to Logic offers one of the most clear, interesting and accessible introductions to what has long been considered one of the most challenging subjects in philosophy. 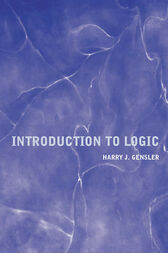 Harry Gensler engages students with the basics of logic through practical examples and important arguments both in the history of philosophy and from contemporary philosophy. Using simple and manageable methods for testing arguments, students are led step-by-step to master the complexities of logic. Harry J. Gensler is Professor of Philosophy at John Carroll University. He is the authir of Gödel's Theorem Simplified (1984, Logic: Analyzing and Appraising Arguments (1989), Symbolic Logic: Classical and Advanced Systems (1990), Formal Ethics (1996), and Ethics: A Contemporary Introduction (1998).